A blog by Michael Wheatfill covering Microsoft infrastructure and productivity. Hey GTD’ers. There are several blogs out there that describe how to utilize Outlook and OneNote to implement the Getting Things Done methodology. The most popular of the bunch is a collection of posts over at 7Breaths that covers OneNote 2007 and briefs on it’s integration with Outlook 2007. 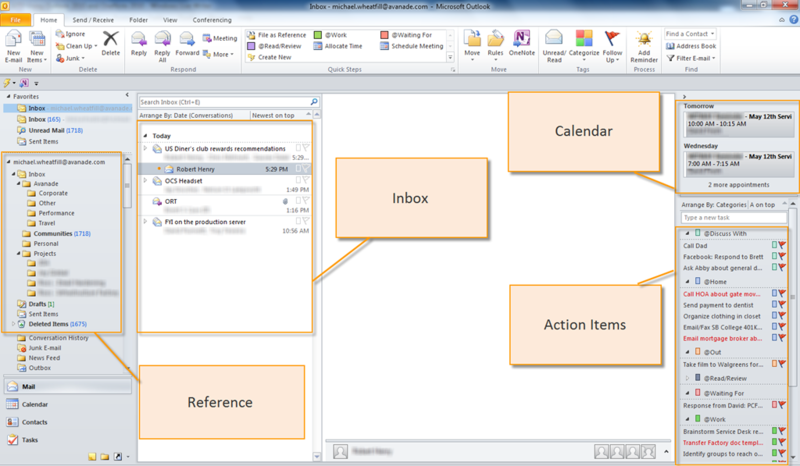 The release of Office 2010 brings quite a few neat features that can be used to make you more productive and organized if you currently use Outlook and OneNote or if you are just starting out with Getting Things Done. This blog post will give a brief overview of my system, which pulls many ideas from the the 7Breaths implementation, and adds my own twists and ideas for making my system work for me. I use Outlook 2010 and OneNote 2010 as the main tools for managing my GTD system. Since I spend most of my time at work on my computer, and the technologies I work with as an IT consultant are Microsoft centric, it makes sense for me to use an electronic GTD implementation with applications I’m familiar with and happen to love…isn’t that why we choose the GTD tools we do? Keep in mind my system is not entirely electronic. I have physical inboxes, filing cabinets and notebooks at home, at work, and a portable system that fits in my laptop bag. Don’t forget one of the most important tools in any GTD system…the ubiquitous capture device. No technology here, just a small Moleskine reporter notebook I take with me everywhere. Outlook is my central hub for collecting and organizing emails, tracking my “hard landscape”, and managing my Next Actions. The screenshot below shows a brief overview of where I spend most of my time, in the Mail view. This gives me the ability to process my inbox, organize my inputs, view my upcoming appointments and get a snapshot of my Next Actions. Collection – No brainer, these are where my emails get dumped! Doing – Do, defer and delegate. I either respond to emails, create Next Actions/Projects or delegate the task to someone else (my favorite). OneNote captures all of my thoughts and notes each day, keeps my projects, support material, Someday/Maybe lists, and provides a place to store all of my electronic reference material. 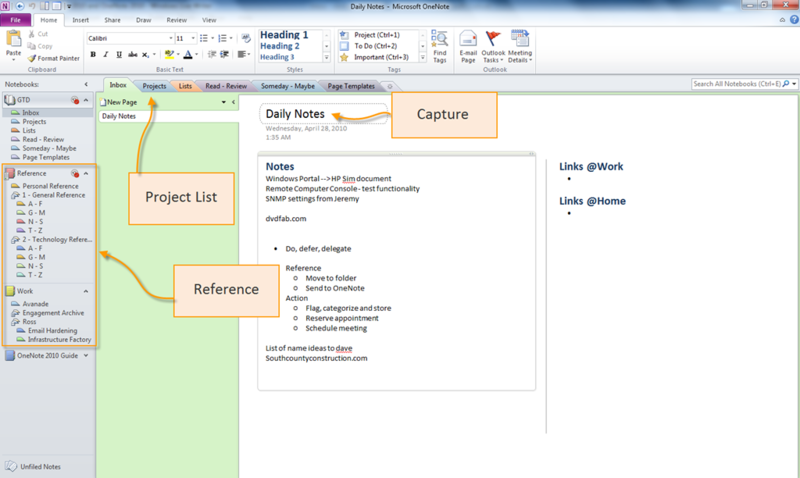 Here’s a screenshot of my OneNote landscape. In any electronic GTD system, the OS definitely plays a role. Of all the information that I process and organize on a daily basis, not all of it can live in Outlook or OneNote (well, it’s possible it can, but just not practical). Some of this information comes in the form of documents, executables, pictures or video. I use the Windows 7 file system to organize this information as well. My goal was to make my file system reference as easy as possible, and something I didn’t have to relearn how to use when doing something outside of Outlook or OneNote. Windows 7 makes things simpler with the default profile folders, folder link favorites, Libraries and fast search functionality out of the box. Now when I have support material and reference that needs to live outside of Outlook and OneNote, I can easily find it using a mirrored context as opposed to remembering where the corresponding folder lives in relation to my information in OneNote or Outlook. My goal with this blog post is to give you a quick snapshot of what my system looks like. The intention was not to deep dive into the details of setup and functionality. Hang tight though! That is exactly what I plan on getting into in the upcoming Outlook 2010 and OneNote 2010 GTD series. Thanks for reading and happy GTD’ing! I appreciate the time you put in getting this information together. I’m excited for the next post in the series. Thanks. Horia, a new post in the series is coming up in the next few days. Thanks for reading! I’m using Office 2007. Could you please talk about changes between Office 2007 vs 2010? This is all very interesting – but I don’t have the $$$ to upgrade to Office2010… Can any/all of this be translated to Office2007 – does any/all work with Office2007? I love one note because it is the easiest app to have my lists sync with my iphone. Now I can capture a project or next action on my phone and skip the collection on the fly. Or simply collect the thought for processing later. But the cool thing for me is Microsoft will let me copy emails into one note and then I have all my information for the next action or project associated with it. I would use tasks, if my iphone synced with tasks, but have found tasks have beef left out of most phones. May i ask one thing that I not figured out? What are you doing with all project material (which is distributed among Outlook, OneNote, filesystem..) when it is done? Are you move them into specific “references”, or something else? I actually implement the same system as you, but it’s frustrated me because i always forget whether i place the reference materials on onenote or in os folder. any suggestions? Either just use the search function in Windows 7 which will pull up results from both sources or leave a pointer on a linked OneNote page (or a hyperlink/simple note to the file if it won’t automatically link). Michael – I have to say I love the way you have put this together and explained it. I am brand new to GTD but trying to implement it. I am apparently a little dense as I have a dumb question. When I have categorized my emails and filed the ones that I can, I am still left with several hundred that will need further actions, how exactly do I get them out of the inbox. The categorization doesn’t remove them and the move to OneNote simply copies it. Do I create another folder like “Processed or Moved” or do I delete them after I have sent them to OneNote? Sorry, just a bit confused. I’m satisfied that you simply shared this useful info with us. Please stay us up to date like this. Thank you for sharing. data you will have here on this post. I will probably be coming again to your weblog for extra soon. Reader’s Feedback: Next blog post?